body that can absorb and convert iodine. Your thyroid gland uses iodine, combines it with the amino acid Tyrosine and then releases this new mixture throughout your bloodstream to all parts of your body. The transportation of thyroid hormones is crucial for regulating metabolism, which is when you convert oxygen and calories to energy. But alas, no hormone or cell works alone and relies on other glands, cells and organs to function. Your thyroid is controlled by your pituitary gland (located at the base of your brain). This gland has many functions, one of which is to monitor the level of thyroid hormones. When T3 and T4 drop, the pituitary gland stimulates your thyroid to release “Thyroid stimulating hormones – TSH” to stimulate the thyroid to produce more of those T3 and T4’s. And yes, the Pituitary relies on another gland, the hypothalamus, to actually make the TSH. But let's circle back to the thyroid, and some of its vital functions. It regulates breathing, heart rate, central and peripheral nervous systems, body weight, muscle strength, body temperature, cholesterol levels, just to name a few. When things go wrong with the thyroid it is usually due to the production of too much T3 and T4 which can lead to hyperthyroidism symptoms of which are anxiety, irritability or moodiness, nervousness, hyperactivity, sweating or sensitivity to high temperatures, hand trembling (shaking), hair loss, missed or light menstrual periods and hard to keep on weight. Or when there is too little T3 andT4, which can lead to hypothyroidism symptoms of which are trouble sleeping, tiredness and fatigue, difficulty concentrating, memory fog, slower heart rate, dry skin and hair, depression, sensitivity to cold temperature, frequent, heavy periods, joint and muscle pain and difficulty losing weight. Is there a natural approach? and hyperthyroidism will differ. Selenium is a trace mineral that functions to support thyroid metabolism and can help both forms of the disease. Vitamin B serves the same purpose because low levels of vitamin B can affect your hormone production up or down. For hypothyroidism, taking an added B 12 and a B Complex (with Pantothenic Acid) may help repair some of the damage the disease caused. 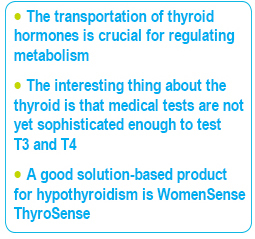 A good solution-based product for hypothyroidism is WomenSense ThyroSense. 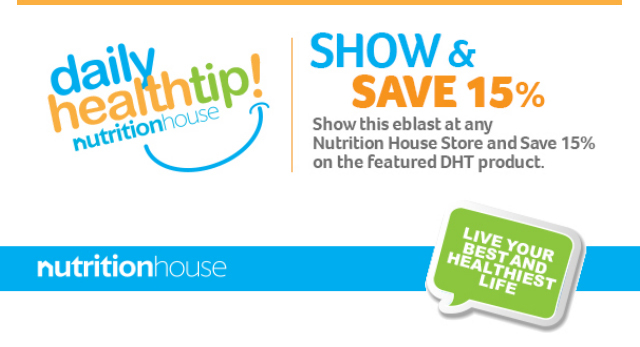 While this supplement cannot replace your thyroid medication, it is a good alternative for those individuals that have borderline underactive thyroid symptoms. 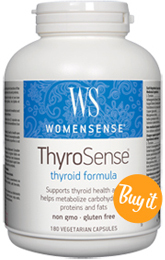 WomenSense ThyroSensecontains a synergistic blend of the vitamins and herbs that have researched benefits for hypothyroid. 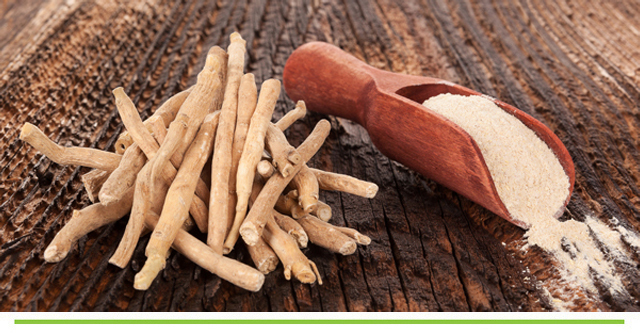 Including L-tyrosine, (required to help produce TSH hormones) ashwagandha, (supports healthy hormone levels, keeps cortisol in balance) guggul, pantothenic acid, copper, manganese, selenium and iodine (supports the production of T3 an T4, that can help enhance thyroid function.) If you are taking medications for hypothyroidism, it is very important to speak with your health care professional before taking a natural thyroid formula such as ThyroSense, as mechanisms of the natural product can disrupt your meds.